Create a beautiful heart shaped photo collage printed on canvas, using the highest quality materials. Why use one photo when you can showcase a whole range of treasured memories or moments from special events. Simply select the photos you’d like to use and our online design tool will automatically create a heart shaped photo collage using your images. Bring a personal touch to a collage design with our contemporary and fun heart collage options. A heart-shaped photo collage canvas is a striking way to display multiple photos creatively, whether you’re designing a special gift, or simply want to display your images in a unique style. Create an impact in any room with this beautiful design. Your heart collage canvas will be printed and produced in the UK on genuine woven canvas, using environmentally-friendly ink. With our professional printing process, your richly coloured print will be long-lasting and vibrant for years into the future. We’re so confident in the quality of our heart canvas prints, that you’ll receive a lifetime guarantee with every order. Create your heart shaped photo collage canvas using our online design tool, which allows you to select various templates and automatically arranges your images. Choose a heart layout with a plain background or a stylish blurred photo-print background for extra impact. Upload as many photos as you like, and you’re ready to go. Make a statement with large heart collage canvases or give a small canvas as a lovely keepsake gift. We offer an unbeatable range of sizes to display your heart canvas prints on. Available in sizes from 30 cm up to 200 cm. For canvases up to 150 cm you can choose from two depth options; 2.5 cm for a lightweight yet sturdy frame, or 4.5 cm for a deeper frame with extra strength. For heart collage canvases over 150 cm, your frame will come in a 4.5 cm depth for added stability. Your designs will be printed on a genuine, 300 gsm heavy woven canvas made from 100% poly. Unlike its cotton counterpart, poly remains strong and durable throughout the years. A delicate grain texture on the surface gives your collage a gallery quality finish, whilst still being soft to the touch with an even and consistent texture. Our canvas frames are created from sustainably sourced pinewood, which is strong and robust to prevent your frame from splitting or warping over time. Every canvas stretcher is crafted on site in the UK and is hand-stretched to create that perfect tension. Rather than the traditional 4 stretcher wedges, we opt for 8 to keep your heart shaped photo collage looking perfect well into the future. 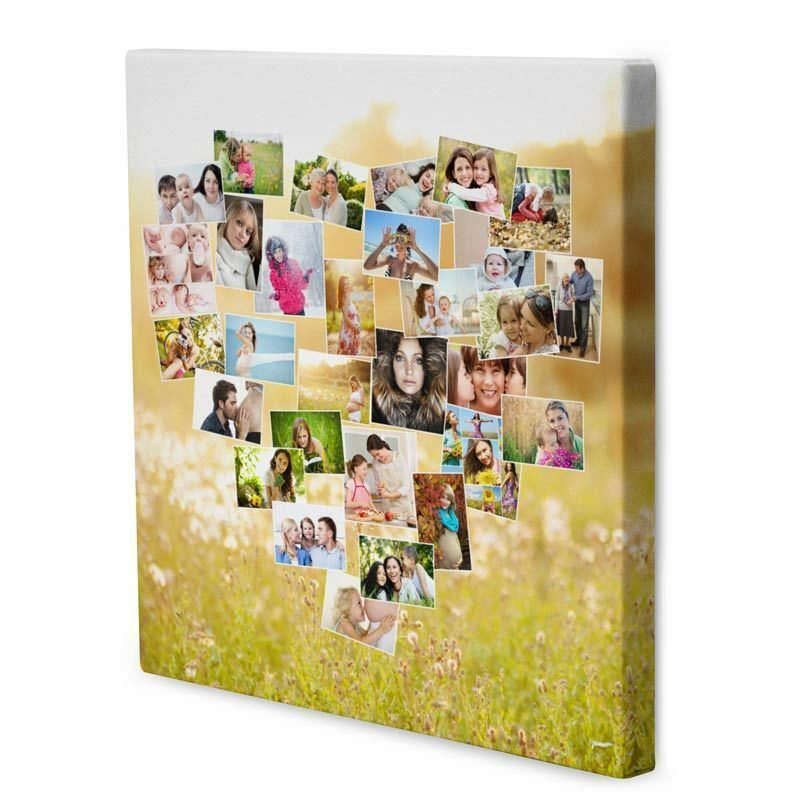 Using sublimation dying, we create a long-lasting and richly coloured canvas print. Sublimation dying uses heat and pressure to lock the inks directly into the canvas fibres, rather than simply laying them on top as inkjet printing does. This durable print is completely washable and scratch proof and has a contemporary matt finish, with no plastic coating on top. Keep your design looking fresh and vivid by keeping it out of direct sunlight. We only use environmentally friendly inks in keeping with our eco-friendly methods of production and dedication to reducing our carbon footprint. Our frames are also FSC certified to ensure peace of mind. Choose a wrap to compliment your heart shaped photo collage canvas design. The wrap is what the edges of your canvas will be filled with. Choose your wrap option once you click “Start Design”, and make sure to check our design tips below so you can select the perfect wrap for your heart canvas prints. There is the option of a gallery wrap where your image extends over the canvas edges, a mirror wrap where the design is reflected, a simple coloured edge wrap or no wrap. To hang your heart shaped photo collage canvas, use the free wall hanging kit which is provided with every purchase. Simply attach the picture hook to the back of your canvas frame, and hang it wherever you choose. The kit includes a picture hook, screws and wall plugs. A heart collage canvas on top of our blurred background option looks stunning with a gallery wrap. Alternatively, choose a chic coloured edge for a contemporary and stylish design for your heart canvas prints. If you’d prefer to use this coloured wrap, select this option and pick the colour you’d like to use for it to automatically be applied. The bleed is the area where leeway is left for the printing process. The bleed area will usually be cut off so don’t include any important parts of your photo in this area – however, it may still end up on the final print so make sure it is filled with part of the design. Heart photo collages are a fantastic way to display a variety of different photos from one event in a unique way, such as a wedding or party. Why not create a gift to remember and design one for a family member or friend featuring photos of the two of you together? You can even add a date or message using our text option, to make it extra special. Heart canvas prints can make a statement in a room and look particularly striking in a room with minimal décor. Larger canvases really add a splash of colour and create a focal point in a room. You could even create three miniature heart photo collage canvases, and display them as a series for a little more variety. The opportunities are endless, particularly with our customizable design options. Play around with our different design options to create the perfect heart collage canvas for you. Choose different backgrounds, wraps, shapes, and even add text or choose the ‘Do it yourself’ option for full creative control. For a classic heart montage, select the ‘Frame heart’ option which will scatter your images in a heart shape on a softly blurred background of one of your images.